wait, what? isn't that how old my mom is right now? Wait, I remember my mom when she was 33. Keenly. And vividly. I can't believe I'm in a stage of life when I am turning an age I remember my mom being. So sometimes all of this comes to a head when I'm standing in the wine aisle of trader joes, like I was today, picking out a bottle of wine for my birthday. Because it's oddly like how it was when I 23 and picking out a bottle of wine. "Oh that one looks pretty! I wonder if it's sweet or if it tastes like old shoes?" I miss to myself and my four year old. "You need pink, mommy," she says. "Because pink bootiful!" I agree. Pink it is. I've always secretly liked pink. And then Rebel Rebel comes on while I'm standing there and just like I couldn't resist dancing to it when I was waitressing and my friend Matt would put it on the old jukebox, I couldn't resist in the middle of the aisle as I scoped out the wine. Some things, no matter how many years go by, never change. My four year old then announces loudly, "mommy, you love this song? You dancing and dancing and dancing! I take your picture!" So we stop dancing and pink wine selecting for a moment to take a picture. Because some things do change. 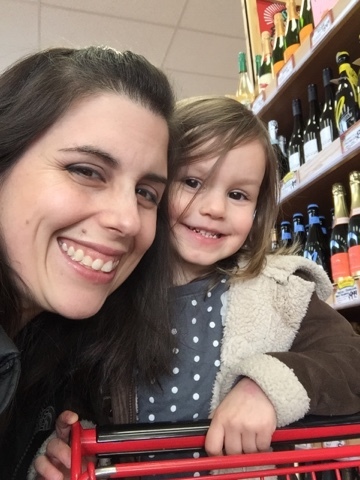 At almost 33 my inhibitions about dancing through the wine aisle of the grocery with my little and pausing for a selfie with her have faded because I'm no longer ruled by the fear of judgments from passersby. And I'm no longer ruled by the fear of stepping on the scale and being met with a number I would have gasped at a few years ago but slowly closing my eyes and instead offering thanks for almost 33 years in this amazing creation of a body. Or by the fear of saying no to something that's not right for the right now. There's something comfortable and almost trait worthy about this skin, this heart, this body, this wisdom God has graciously gifted me that I'm now living in, and I'm almost 33 and I'm not sure thank you is quite enough of an almost-birthday prayer to a God who has afforded me every breath my whole life and every bit of goodness my heart knows. But somehow, at almost 33, I think He knows just how much heart is behind those two little words. So that's what I offer today amid all the differentness and all the sameness, amid my dancing rebel heart: thank you, Lord.